JACKIE is a mesmerising portrait of Jackie Kennedy in the immediate aftermath of the assassination of her husband, President John F Kennedy. It attempts to give us an intimate portrait of one of the most recognisable and yet most enigmatic women in history at both her most vulnerable and strong moments - when she's both dealing with her personal shock and grief, but also struggling to protect the legacy of her husband and to shape his place in history. We are left with a picture of a woman who is intelligent, fierce in her protective instincts, but not above sly manipulation - Jackie as a political player then, equal in her influence to Bobby Kennedy, and a match for LBJ and even General de Gaulle. We get Jackie famously refusing to change out of her blood-stained clothes for the cameras as well as the less well known fight to have an Abraham Lincoln style full state funeral. But at the same time, we are given a tragic portrayal of just how quickly the machinery of power, rightly but savagely, moves to protect the new President, and just how quickly the old President's wife and children are cast aside. Screen-writer Noah Oppenheim's choice to focus on Jackie and to make JFK, who killed him, his actual politics, almost incidental is novel. But so too is Chilean director Pablo Larrain's decision to tell the story using a complex non-linear structure. We move back and forth from the assassination to the autopsy to the swearing in to the funeral arrangements to the interview Jackie gives to a journalist where she creates the myth of Camelot. But even this dizzying back and forth is intercut with flashbacks to Jackie guiding TV viewers through the White House in meticulously re-created awkwardly staged black and white footage, not to mention White House recitals and balls. The vivid primary colours of the times of Camelot - Jackie in stunning ballgowns dancing with her prince, make a stark contrast with the dun-coloured scenes of Jackie alone in the White House after his assassination, and sitting in the dreary rain-soaked country house to give her interview. Kudos to Larrain and editor Sebastian Sepulveda for managing to pull off this complex construction while but not losing the viewer. 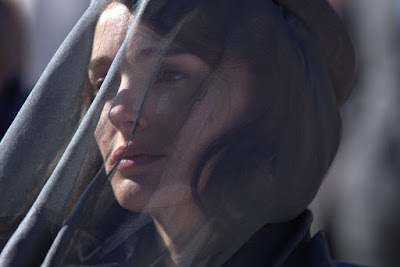 In front of the lens, Natalie Portman gives her best performance since BLACK SWAN, capturing both Jackie's private and public personae. In private she's tough and straightforward - in public her voice becomes breathier, higher-pitched and more childlike, more fragile and unthreatening. The transformation - both through costume, accent and modulation, is quite stunning. The rest of the cast - Peter Sarsgaard as Bobby Kennedy, Greta Gerwig as Jackie's confidant, Richard E Grant as her decorator and Billy Crudup as the Journo are given less to do, but do so well. John Hurt is a scene stealer as the Irish Catholic Priest trying but failing to help Jackie find some meaning in the crisis. This remains, then, a movie that is essentially about one actor's performance and the daring construction of a film that is scrupulous in its period detail but feels anything but like a conventional, over-earnest, over-dignified period drama. And while Portman will get all the awards, one rather hopes the editor and director won't be overlooked. JACKIE has a running time of 100 minutes and is rated R. The film played a number of festivals last year including Venice, Toronto and Austin. It opened in the USA last year, and opened earlier this year in Finland and Denmark. It opened this weekend in Croatia, Macedonia, the UK and Ireland. It opens next week in South Korea, Germany, Greece, the Netherlands and Sweden. It opens in February in France, Brazil, Kuwait, Poland, Hong Kong, Israel, Portugal, Chile, Singapore, Spain, Norway, Argentina, Georgia, Italy, Russia, Lithuania, Mexico and Taiwan. It opens on March 3rd in Taiwan, Serbia and Estonia, and in Japan on March 31st.